“Rabbit, Rabbit, Rabbit!”, if exclaimed on the first of every month is said to bring good luck. But a Chinese proverb warns not to depend on a lucky rabbits foot for fortune, as ‘it didn’t turn out so well for the rabbit, did it?’ The collective archetype found in the symbol of the Rabbit around the world is as diverse as all the worlds cultures. The meaning of Rabbit can range from brave to cowardly, lucky to tricky, abundant to victim depending on your ethnic background. This diversity of meaning illustrates the underlying spirit nature of Rabbit medicine as highly interpretive and adaptable. Erratic and unpredictable, this animal warrior leaps at life with humble pride and teaches the difference between caution and fear, movement and stillness, and the snares of assumptions. 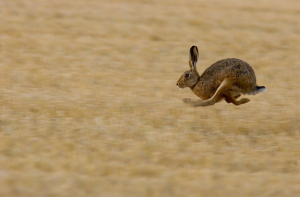 Rabbit shows us how to enjoy the meadow and the day despite the dangers circling all around. For detail sake, rabbits are not hares and Jack Rabbits are not rabbits. They’re hares. To confuse us further, both rabbits and hares are classified as lagomorphs not rodents, but are in fact descended from the rodent family. Rabbits are smaller than hares with a much larger diversity of domesticated shapes and colors. Hares (jack rabbits) have much longer ears, are not tamable as pets, and shift between two coat colors; summer brown and snow white depending on the season. Lagomorphs are the iconic symbol of ‘prey’ and are the most widely hunted creature among all the predatory animals next to mouse. Sought after by snake, hawk, owl, lynx, and man (to name a few), Rabbit medicine employs a variety of survival strategies that emphasis pacifism rather than aggression. This prolific breeder insures his survival as a whole species (rather than as an individual) with year round breeding and large litters. He employs athletic prowess of acute 360 degree vision as well as his signature hop which can vault him into speeds up to 45 miles per hour. Moving in zig-zag tactics to dodge the slings and arrows of life, there is no direct path to a goal when working with Rabbit medicine. Progress is often felt in unpredictable leaps and bounds but the movement is deliberate and never wavers in indecision. Rabbit did not develop much exterior structural protection. He lives in extreme sensitivity and full exposure to the pleasures and pains of every day. This vegetarian is born with his eyes wide open and can fend for himself within minutes of arrival onto Earth. 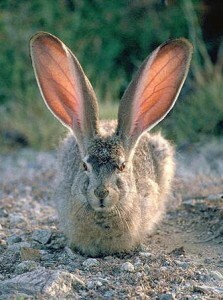 His beacon-like ears can follow a sound, pivoting without the bother of using his whole body, allowing for simultaneous relaxation and caution. Rabbit is a valiant jumper, but within an instant, can shift from motion into a stillness so complete it seems to bring him to the edge of non-existence. Mother rabbits are devoted toilers who keep their babies in burrows, feeding them in the morning and at night. She leaves home during the day and spends most of the day feeding herself. Her plant based diet requires constant grazing. If you happen upon a burrow of baby rabbits do not worry that they have been abandoned. Mom is at work and will be back later. And the tiny animal, though vulnerable, is in fact much safer when given the ability for personal sovereignty in his own birth place. 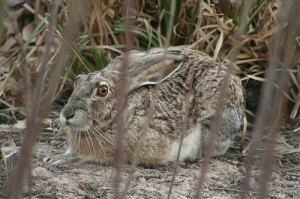 The aspect of fertility in Rabbit medicine asks that we not be too precious about a single idea or project. There are lots of ideas and lots to study. No single topic is the answer. Creativity must circulate and cross pollinate with a variety of influences. Rabbit knows it is your effort that is the source of power, not your already existing accomplishments. Tear off that last sheet of paper and keep sketching, writing, singing, dancing. The process is the way to access life. Rabbit asks you to be aware of how you do what you do. If there is no joy in your activities, stop and ask yourself why you are doing it at all. Nature is scary and brutal but Rabbit is prepared. His medicine welcomes all experiences, large and small, harsh and comfortable. They are devoted loungers despite the dangers of living on the edge of the food chain and his medicine teaches us how to move with the ever-shifting climate of life in the wild. He does not dwell on theoretical dangers or fret over circling enemies. He deals with reality as it happens, forgetting trouble the instant it is out of sight. This sensitive soldier knows you can only deal with what is in front of you. He asks you to trust that your range of vision is all you can be responsible for. 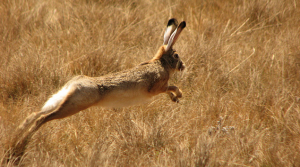 Rabbit medicine makes no assumptions about the outcome of an event based on past experience. Every moment is new and is evaluated independent of the previous moment. This way of life is an investigation into the mechanics of fear and teaches the differences between fear and caution. Fear destroys one’s ability to enjoy the day. Caution is a practical awareness of potential danger that allows us to live life to the fullest. When trouble emerges, Rabbit takes action. When trouble is gone, rabbit returns all his attention to the beauty of the field around him. He is a master of mental efficiency and shows us the skills of living with intense honesty to the present moment and not allowing our preconceived notions to cloud reality on the ground. Running from what we are afraid of puts us ‘on the run.’ Living in a chase dynamic will only lead to eventual capture. You can’t out run your fears and they relish the hunt. It is best to admit them in all their uncomfortable ugliness. Your fears are always worse than reality because fear dwells in the limitless realm of the imagination. Reality is always much less dramatic and much easier to handle. The phenomenon of fear derives from our mental ability to remember past pain and anticipate future pain. Neither of which are occurring now. Mental anguish can only survive in memory or imagination. Rabbit survives by balancing the knowledge of potential threat with the reality of what is happening in the moment. When out of balance, Rabbit medicine is snared by mental traps and he compulsively broadcasts to the world that which he fears most. This compulsive broadcasting ironically calls forth the very predators he wishes to avoid, teaching the lesson that what you seek you shall find. The third dimension is an open system where all polarities converge. Here you can find heaven right next door to hell. Balanced Rabbit medicine is not confounded by this baffling paradox. Life moves and so must we. Your inner experience of acceptance is more important to attend to than any outward appearances of bravery. Be what you wish to seem to others. All living beings have extraordinary powers of perception. We are able to read in an instant the quality of another creature’s energy. We know at light speed what their disposition is even before they mention it. Deception is not possible indefinitely. We are just too smart to be deceived. All the fears and ‘flaws’ that we think we are so cleverly hiding are quite visible for all to see. The truth of us is in the eyes, in the shoulders, in the tones of our voice, not the words we use. Casting illusions is an invitation to the hunt and illusions never last. There is nowhere to hide under the sun so confront your fears and be what you are, whatever that is. But Rabbit knows it is not possible to vanquish fear entirely. It is an inextricable feature in the landscape of the Great Mystery. You can no sooner rid yourself of fear than you could rid yourself of the sky. It is all around. It is a part of life. The Warrior Rabbit cautions us to beware the fearless warriors for they are lying. True warriors have learned how to live simultaneously with the paralysis of the unknown and to move through that darkness with fear (despite fear), allowing fear to be but not allowing it to stop the quest of seeking. Fear is an indication that you have struck upon an experience that will certainly teach you something true. You can not cloak fear and you can not expect to rid yourself of it. You can only accept the limitations of your current perspective and move forward in an effort to broaden that perspective. True learning can only happen when we drop our guard and yield to the unknown. Rabbit takes no armor into battle save tooth, claw, and a will to live. He is bravery perfected and his tribe thrives with unexpected strategies.